Poker is a classic table game, and Five Card Draw is a famous poker variant. It used to be the most popular one until Texas Hold ‘Em stepped into the spotlight. You can play it surrounded by a group of friends, just like any other home game. And that is great, because you get to play a live game in a familiar surrounding. Being a variation of poker, Five Card Draw remains a strategy game. That means that certain rules and approaches have to be there. You must have heard about the expression “poker face”. It obviously originated from poker, and it regards the facial expression that does not let your opponents know how good or bad your hand is. However, before you get into those details and start depositing, you must learn the basic. In the spirit of starting from scratch, I will explain the rules you need to know by heart to play poker profitably. The people you are playing with may be your friends, but at the poker table, everyone is against each other. The foundation of poker regards cards you may be dealt during a game. Memorizing poker hands is essential, because you do not want to end up looking lost and confused when you ought to be piling up the cash. I will list the combinations of cards from the highest one to the lowest one for you below. 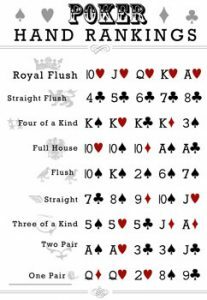 Royal flush — the most powerful hand possible. It includes all the highest cards, and all of them are of the same suit. For instance, if your hand shows Ten to Ace and all cards are in clubs, you can rejoice and try getting others to place more chips on the table. Straight flush — this hand is the same as the previous one in every aspect except for one. The five cards do not have to be high, they just need to be in a sequence. Four of a kind — This hand that incorporates four cards of the same rank. Full house — three of a kind combined with two cards of the same rank. Flush — all five cards must be of the same suit, whereas their ranking within the deck is irrelevant. Straight — any five cards in a sequence. Three of a kind — same as four of a kind. Two pair — Two cards of the same rank, twice.. Pair — the combination of two cards of the same rank. High card — Provided you have none of the above, you simply use the card with the highest value from your hand. Once you know the purpose of five card draw is to aim for the high hands, it is time to go through the order of events that precede that. Basically, you must know how to start if you plan to finish in style, just like a proficient poker player would. The game starts when the dealer gives five cards to everyone. Once every player gets their cards, they get to place their initial wagers. 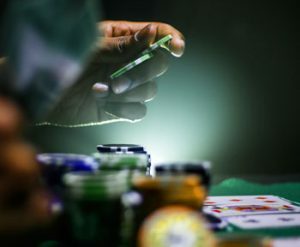 Given that the goal is to acquire the best possible hand, this is the moment the players start striving towards the most profitable combination. They do it by discarding some of their cards and requesting new ones. Afterwards, another round of bets takes place. Those who remain in the game up to this point reveal their cards in what is known as the “showdown” and the player (or multiple players) with the strongest hand gets to claim the pot. Similarly to other types of poker, the Five Card Draw features two popular “modes”. Depending on the mood and everyone’s preference, you can start a round playing a blind game or an ante game. In case your variation of choice is the blind one, you will have to include two new “positions” in your game, the first one is the small blind and the other one is the big blind. The small blind is the player sitting to the left of the dealer. As opposed to the usual sequence of actions, they place their wager before the hands are dealt. The player to the left of the small blind is the big blind, whose bet is twice as big as the small blind’s one. Once the cards are dealt, only the players who manage to match the big blinds bet can participate. The variation called ante implies that every player has to place their bet before the cards are dealt. It spices up the game as you cannot expect anyone to fold, at least at the beginning. Even if you have never played any variant of poker, you must have heard of the terms the players use, such as check, call, raise, and fold. You are probably curious about their meaning, especially now that you want to get involved in the game. Let’s assume the game is in progress and nobody has placed their bet. If that happens to be the case, you have the possibility of checking, which means you wager nothing. However, once a bet is placed, you need to make one of the following moves. When you call, you wager an amount of money equal to the ones that are already on the table. For instance, if everyone bets $5, you bet the same sum by calling. Raising the bet means wagering more than the player to your left. By making this move, you force other players to call in order to continue playing. In case you consider your hand to be a bust, you can quit the round in progress by folding. Simply throw your cards face down on the table, and you are out. By introducing certain novelties, you can make this variation of poker even more entertaining. One way to do that is to incorporate wild cards into the game. They have the power of substituting some other cards, which makes it easier to have a winning hand. Nevertheless, not every card can replace all the other ones. 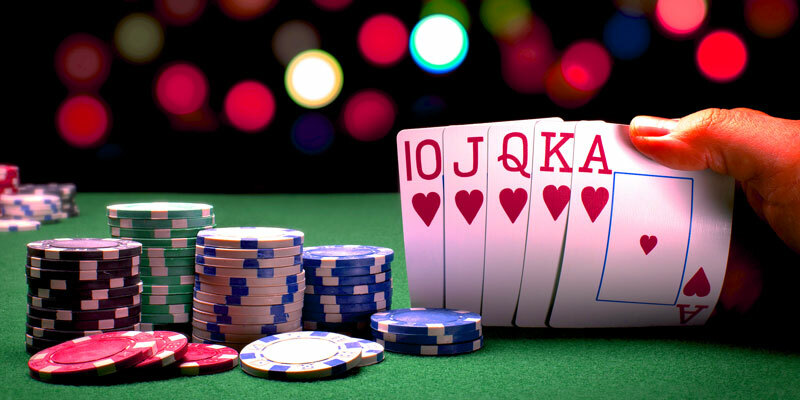 If you select Joker as your wild card, it can only act as an Ace, a complete straight or a flush. In addition to that, the number of cards you are playing with increases. Another addition to the game can come in the form of limits. Including limits can be useful if you want to be in control of how much you spend. You can do it in two ways. Either you determine the minimum and maximum bet for every round, or you decide that no bet can exceed the amount of money in the pot. Yet another way to mix things up is ranking the cards so that the high ones become the low ones and vice versa. This option keeps the game going in case everyone is dealt worthless cards and consequently keep folding. As you have seen for yourself, Five Card Draw is quite an entertaining game with rather simple rules. You need to memorize hand ranking and the moves you can make, and you can start to play. However, the key to unlocking big winnings in the game of poker does not lie only in the rules. Once you master them, you need to practice and learn how to apply them to your game to make the most out of them. Fortunately, you can make the perfect environment for that. Just gather a group of friends and throw a poker party.